One of the great tensions of leadership, perhaps especially Christian leadership, is the tension of how much weakness you feel you are permitted to show. Our flesh wants to be understood and to be empathized with, so in an effort to attain both these things, often times a leader can use transparency about their own pain and struggles to win the affections of people. The tension exists in using transparency to be helpful and relatable without crossing over the line into being cathartic and trying to gain sympathy. We cross that line for all kinds of reasons, usually because we want to distract people from something that is not going well so we try to conjure up a mercy from people that probably wasn’t missing in the first place. When that line is crossed, I may well be prioritizing helping myself over helping the audience or congregation or group to which I am speaking. I’ve definitely been guilty of that. A few years ago, during the most difficult trial I personally had walked through, which was quite long and drawn out, there were distinct moments when I chose to talk about certain elements of that in my messages. It wasn’t over the top. It wasn’t often. But I still knew in those moments that my own soul was looking to be fed from a table that would leave me wanting. You can usually tell you are sitting at that table when your transparency casts an unsavory shadow over someone else rather than on yourself. The tension is there, and we all need the Holy Spirit to guide us in picking up and using the tool of transparency in our leadership. That said, there is a well-known power in transparency amongst leaders, perhaps particularly so within a movement such as ours which is very relational. We know that transparency and vulnerability often win out over tough but insincere facades. We know that people identify themselves more with our weaknesses than they do with our strengths. And yet, speaking for myself, I still feel the inner war within me many times when I feel prompted to be transparent in a moment that would be so helpful. I suspect that you feel that too. Whether it is in a staff meeting, on social media, or on your Sunday platform, it can be challenging to push through the worry of people’s perception of you in order to say something that removes your “God has not given me a spirit of fear but one of power” persona. However it is possible, even more likely, to be seen as having bold faith when you are vulnerable about your fears. It is possible, even more likely, to be respected when you admit you don’t have all the answers. My encouragement to each of us is to emerge victorious from the inner war and to choose the transparency that we know will be helpful. Most recently I felt I had to do this with our church because of a move we made in one of our locations. We went from gathering 15 minutes outside the city to right in the heart of Downtown Los Angeles. If that sounds like a small thing geographically, it was pretty huge psychologically. Honestly it has been amazing, and I’m so glad we took that step of faith. But right after having made the move, I felt very anxious and as though we’d made a giant mistake. Purely for brevity’s sake I won’t get into the reasons why, but they were certainly not grounded in fact, much less faith. Suffice it to say, about a month after the move, one Sunday after (truly) an awesome day in church I posted up a photo on Instagram and shared in the caption about how uncomfortable, intimidated, and overwhelmed I was. The hugely positive response from so many people both on and off Instagram reminded me about the power of vulnerability yet again, and that people don’t need to know how fearless or strategic you are. 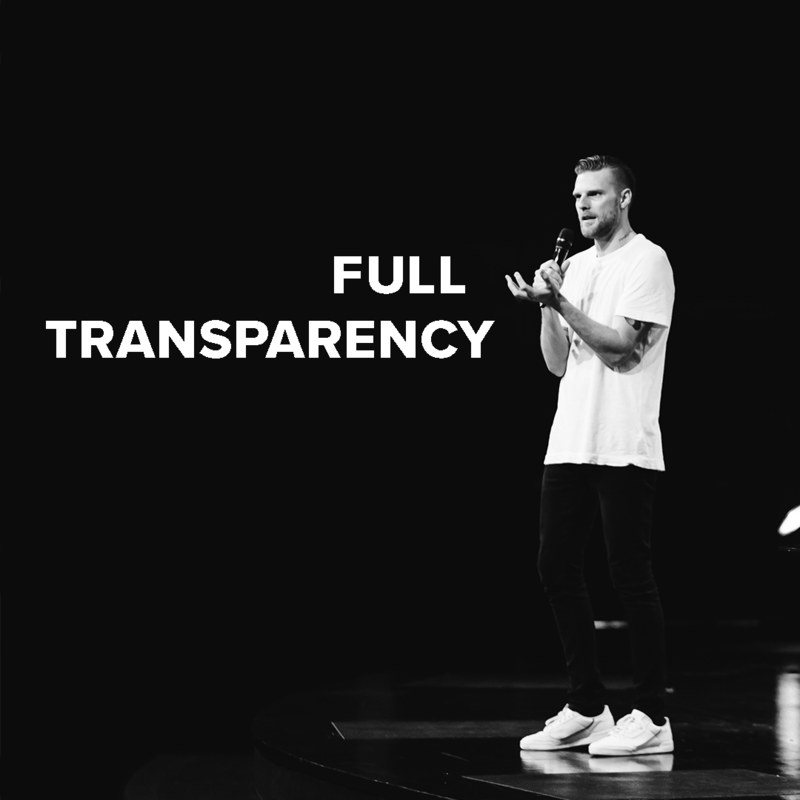 They need to know how reliant on God you are, and what is transparency if not revealing exactly that? To find out more about C3 Los Angeles, visit c3losangeles.com. Jake, this is amazing!! So proud to know and love you and your family. I love how God is using your trial to inspire and challenge pastors and leaders all over the world. Well said Jake. Our people don’t need to think we are invulnerable. Interestingly Paul spoke occasionally of his fears, and trials – enough for us to be encouraged and not too much so that we would be discouraged.